If there's a place where I always, always shop for clothes.. that's only SM. I mean, I also go to boutiques and branches of both local and international brands, but SM Department Store has more affordable choices for me. Anyway, here are my personal picks from SM Ladies' Fashion Holiday 2012 Collection with top fashion bloggers on the runaway. Camille Co's sleeveless white top and polka dot ensemble and Patricia Prieto's dress with lace lining are screaming retro. I have to say these tops Laureen Uy and Lissa Kahayon are wearing reminds me of Marc Jacobs Collection for Louis Vuitton Spring Summer 2012. 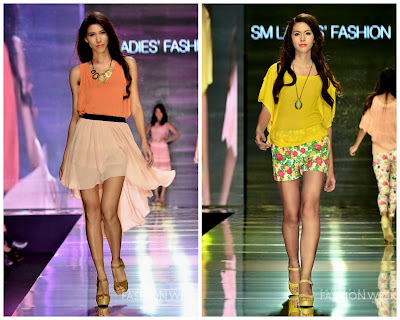 Pastel colors, mullet skirts, sheer fabrics and florals are still in. Yay, I would like to have those pale orange top and yellow platforms. More must-haves for the holidays is that tailored jacket and electric pleated skirt. Pang Kate Middleton ang peg. 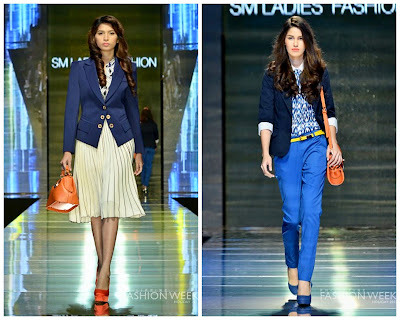 Hey, those cobalt blue trousers that Pauline Prieto (Patricia's sister) is wearing look pretty stylish too. And the scarf dresses in fun colors are here. I love them both. They'll be perfect for year-end parties. Still stripes, laces and sheers. Don't you adore that finale dress Ria Bolivar is wearing? Bravo SM Ladies'! i love patricia's aura, the maxi dress and ria bolivar of course!!! :D why did i miss this one! I love maxi dresses, as they look good on any figure. I haven't been to SM in a while, though :). Who's bare face do you like the most?